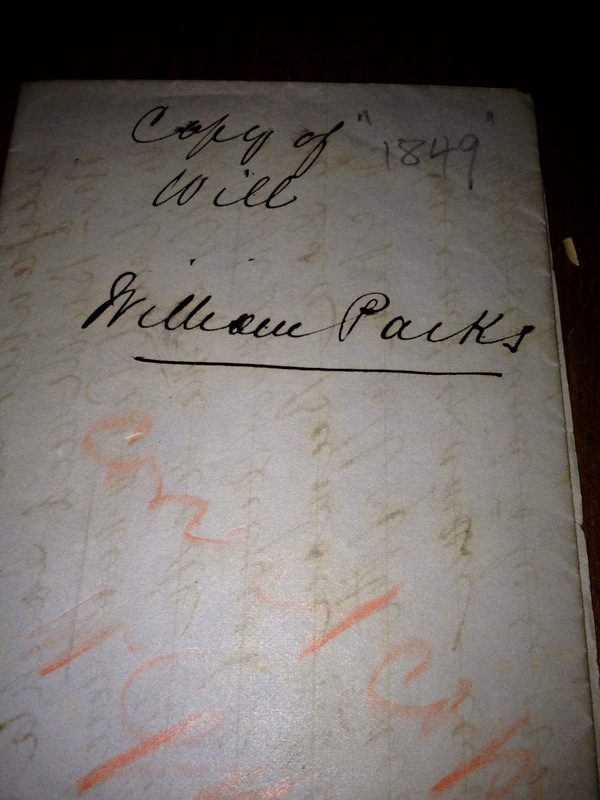 This genealogy treasure is a hand-written copy of the original will of William Parks dated 1849. I purchased this in a bundle of old documents, deeds etc. in Kingston Ontario. William Parks states he is a resident of Richmond Township in the District of Midland, Province of Canada. This is now Richmond Township, Lennox & Addington Counties, Ontario Canada. The land he bequeaths is noted as being Lot 16, Concession 6 in Richmond Township. Many of the documents are about that specific piece of property over the years and I will get to each of them as I go through the papers. So each one will be a blog post. In the will, William mentions his wife Rebecca is to have 1/3 of the homestead and a place in the home as long as she is his widow. This is pretty standard stuff for the time period. Men often left their wives provided for with a roof over their heads as long as they did not remarry. I conducted my own research on Ancestry.com on this family and found that Rebecca married again after William's death, first to a Mr. Leggatt or Leggette then to William McKittrick. 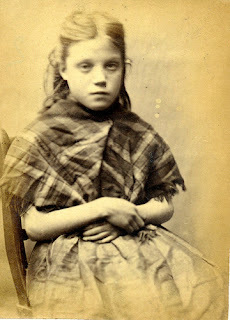 She had one child by Mr. Leggatt were a daughter Sarah Margaret born ca 1853. She had one child by Willliam McKittrick were James born ca 1858. Rebecca appears to have adopted a daughter Cynthia Dennison who later used the surname McKittrick. In the 1881 census on Ancestry.com , Rebecca McKittrick is found as a 54 year old widow with daughter Cynthia McKittrick age 15. Her son Reuben Parks is living next door with his wife and family. While on a short vacation in Ontario recently, hubs and I visited a few antique stores. I found quite a treasure at one - dozens of old land documents dating back to 1849! Of course I couldn't pass them by so I purchased the lot. I have an overpowering urge to save and archive these kinds of old documents. I can't see them lost. So my plan is to go through them one by one and blog about each one here on Olive Tree Genealogy. Perhaps a descendant will see a record of an ancestor. If I'm really lucky a descendant will stumble on one that I write about and want to own it. I don't want to keep these papers, I just want to be sure they are preserved and passed on to others. A quick glance shows that these documents are mainly land records (Mortgages, Deeds, Instruments etc) for Richmond Township, Lennox & Addington Counties, Ontario Canada. One of the documents is an original will from 1849. One that I looked at (yes I was too curious to wait!) was sent from USA but I haven't read it to know what it's about. Carscallen, Dennison, O'Ray, Walker, Hall, Davis, Jemmett, Windover, Winter, Hall, Wilson, Williams, Wilde, Andrews, McQuaig, Parks & Jackson. 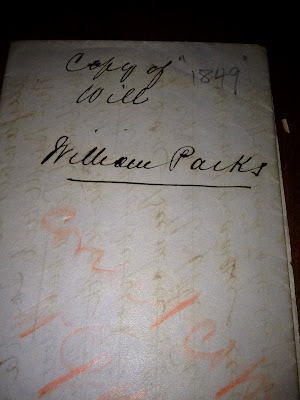 The original will from 1849 is for William Parks of Richmond Township. I'm really excited to extract the names of his heirs from that document. There are approximately 20 documents dating from 1849 to 1938 but there may be more as I saw loose papers tucked inside documents. Now I'm going to start archiving this genealogy treasure trove and placing the documents in archival holders. Eventually I'll do a bit of research on each name. 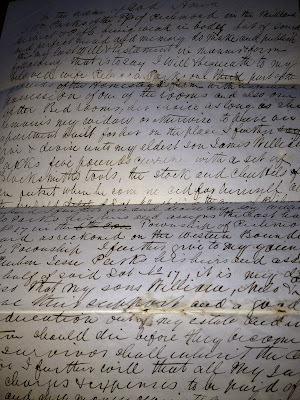 If any readers are involved with Lennox & Addington Counties mailing lists or message boards, please let them know that this set of genealogy documents is coming online. Recently hubs and I created a cool genealogy gift for one of my sons for under $50.00. And it took less than 30 minutes to make. My youngest son is in the Canadian military and we wanted to surprise him with a military inspired photo for his basement rec room. I have several photos of ancestors in military uniforms but wanted one that could be enlarged without too much fuzziness. First I took a slightly-creased 4x6 photo of my grandfather Charles Henry Fuller in his military uniform circa 1910. I uploaded the photo to Shutterfly and ordered a poster-size print. Poster prints are less than $25.00 normally but I actually got it for free during a special thank-you offer. Next hubs purchased a $20.00 black frame from Wal-Mart. It is a 2 foot by 3 foot frame, large enough to allow room for a small border or matte around the poster. The next step was the most difficult. Hubs removed the paper insert from the purchased frame and turned it over so that only the white backing showed. Then he carefully centered the poster print on the white backing. Once the print was centered he used packing tape which he folded so that it had two sticky sides and tape each corner of the print to the backing. Voila! A lovely poster with a nice white matte. Next came a brief bio of Charles. I printed out his name, dates and locations of birth and death, and added a brief summary of his immigration from England to Canada in 1913 and marriage to my grandmother Ruth in Toronto in 1914. Using packing tape, hubs fastened it to the back of the frame. I deliberately did this bio by hand rather than typing it even though it would be much neater in typed format. But I wanted to personalize the bio with my handwriting and at the end, the date and my signature. I did that for descendants as I'm hoping the poster will be passed on to one of my son's three sons and continue on in the family as long as it lasts. Save $20 when you purchase a Flip-Pal Mobile Scanner plus a Picture Keeper PK 8! Purchase a Flip-Pal Mobile Scanner with Digital Creativity Suite 3.0 DVD and get a Flip-Pal mobile scanner Sketch Kit FREE! This sleek case keeps you organized while you are on the move. You can now automatically backup the digital scans on your computer and put them in a safe place. Just insert the Picture Keeper into any USB port on your computer, click "Start Backup" and the Picture Keeper automatically ﬁnds and saves your pictures. That’s it! Be sure to back up your digital images! This new DVD bundle comes with software that works on both PC and Mac computers. Your customers can make professional-looking projects with Photoshop Elements 10.0, Logo Design Studio Pro and Corel Paint It! The Sketch Kit now comes with three pens—two black and one red! Your customers can annotate scans of their photos by adding dates, names, places and more. LOS ANGELES, July 24, 2012 - Findmypast.com, a British-owned family history website, is marking its launch into the U.S. genealogy market on July 24 by offering its first customers a world subscription at a 75 percent discount – just $4.95 per month. This introductory price point will give access to not just a wealth of US census and vital records but also a vast overseas collection. The latter includes almost 1,000 unique British, Irish and Australian record collections, some of which contain up to 30 million records in a single collection. Findmypast.com is offering a limited number of these introductory-rate subscriptions on a “first come, first served” basis. “The genealogy community knows $4.95 per month for these records is a steal,” says Brian Speckart, marketing manager of North America for findmypast.com and brightsolid online publishing, its parent company. “We want those new to family history searching to understand the weight of this offer before it’s over. A 12-month World Subscription to findmypast.com will normally cost $20.83 per month or $249.95 year – but customers who are quick enough to secure the “Pioneer Offer” will get one for just $4.95 per month or $59.95 per year. Findmypast.com is the new US addition to a global network of findmypast websites – it joins existing findmypast sites in the UK, Ireland and Australia. It has recruited a separate US team, based in a new office in Venice, California. It is also a participant in the 1940 US Census Community Project, which is currently indexing the 1940 US Census, for viewing on findmypast.com. For more information on other subscription and payment options, visit findmypast.com. CREATE smaller branches of your family or merge trees together to make a master file, then easily clean up duplicate people along the way. BRING your tree to life with dozens of customizable reports and charts, timelines, etc. SAVE the records you find to your own computer and access your tree offline. Press Release: FindMyPast.com Launches into USA July 24! BRITISH "DAVID" TAKES ON BILLION-DOLLAR U.S. "GOLIATH"
San Francisco, CA, July 24, 2012: Findmypast.com, a British-owned family history website, is launching into the growing U.S. genealogy market on July 24. Findmypast is the flagship brand of brightsolid online publishing, a UK and world leader in online genealogy, with 18 million registered users across its family of sites, over a billion genealogical records dating back to 1200 – and a growth rate last year of 75%. Yet, findmypast.com enters the U.S. market in the role of David facing Goliath in the shape of ancestry.com, the overwhelming market leader and the world’s largest genealogy company, with a market capitalization of a billion dollars. The launch of findmypast.com will offer U.S. customers access to not just a wealth of U.S. genealogical records but also a vast overseas collection. The latter includes almost 1,000  unique British, Irish and Australian record collections, with some single collections containing up to 30 million records. “This sort of added choice and competition has got to benefit U.S. consumers”, says van der Kuyl. Findmypast.com is the new U.S. addition to a global network of findmypast websites – it joins existing findmypast sites in the UK, Ireland and Australia. It has recruited a separate U.S. team, based in a new office in Venice, California. It is also a participant in the 1940 U.S. Census Community Project, which is currently indexing the 1940 U.S. Census, for viewing on findmypast.com. In addition to its unique records, brightsolid prides itself on the unrivalled ease and quality of its search technology and on offering more flexible payment options than its rivals. Findmypast.com will allow users to pay either by the subscription model offered by most US genealogy sites, or on a pay-as-you-go basis, which some users prefer. The U.S. launch of findmypast.com follows the news reported by Bloomberg last month that ancestry.com is seeking buyers. At least one source has mooted brightsolid as a possible candidate. Flip-Pal Mobile Scanner has done it again. That's right - more coupons and deals! The Flip-Pal Mobile Scanner 2012 Christmas in July Sale is on! And Olive Tree Genealogy is giving you a sneak preview of all the specials from today until July 30th. The following promotion codes are valid 12:00 a.m.–11:59 p.m. Mountain Time (-6 GMT) on their respective dates when ordered on their shop page. Please note: these promotional codes cannot be used in conjunction with other promotion codes. Do You Want to be Part of a National Geographic Special? Have you ever wondered where your ancestors came from thousands of years ago? 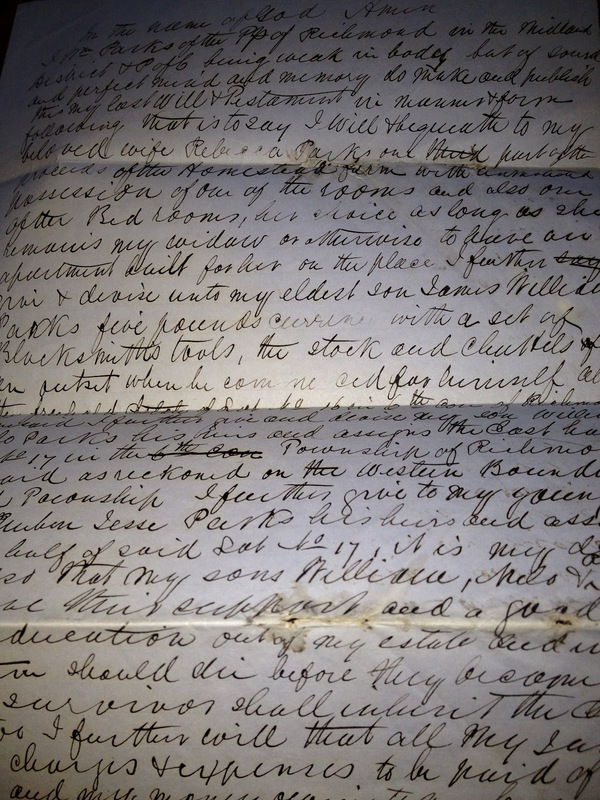 Do you have a burning genealogical question? Are you wondering if you may have inherited a specific medical condition? This is one of the homes I used to live in. 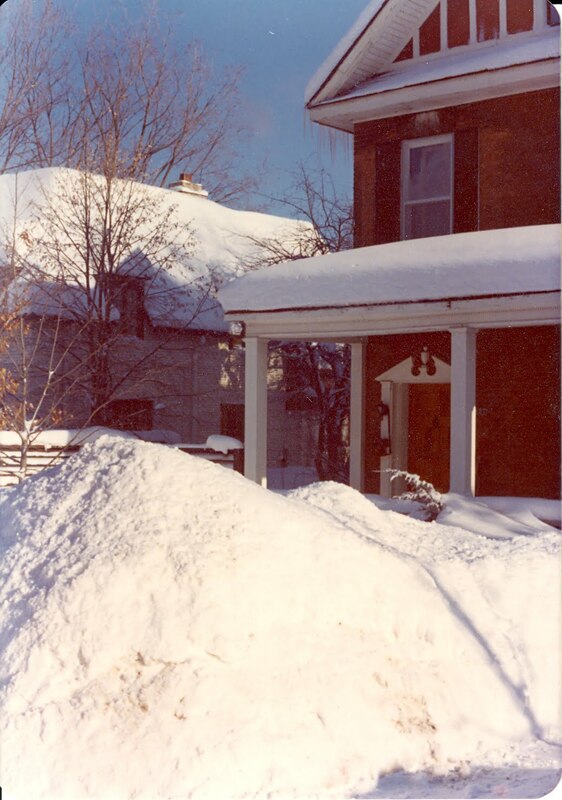 We bought it in 1974 and lived there for three years. It was built in 1902 and has recently been classified as a historic home. I wish the cute little barn/garage at the end of the driveway was visible. I'm not sure when it was built. The home, when I lived there, had a front and back staircase. The back one went from the kitchen to an upstairs bedroom and I assume it was originally for the servants. Here is a photo showing part of the house in the early 1900s. It is the house just left of the tall pole. You can see that it once had an upper story balcony. The second story window on the right was my young son's bedroom (ours was at the rear of the house). We believed the house was haunted. Many strange things occurred in that house and were centered around the rear bedroom and my son's bedroom. When he was 4 years old he insisted that a man came into his room and woke him up every night to talk to him. The couple who bought the house after we left set it up as a Bed & Breakfast and promoted it as haunted. They too experienced unusual events, most centered in the front bedroom. 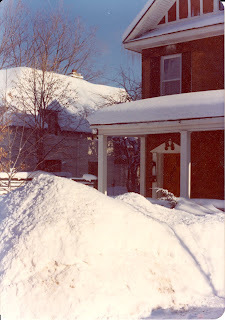 In this photo taken during the years we lived in the house, you can see that it had a different facade on the front of the attic. It's kind of neat that it's been declared a historic home. The S.S. Keewatin is back in Port McNicoll Ontario. The Keewatin was a 350 foot long passenger liner that once sailed between Port Arthur and Fort William (now Thunder Bay) on Lake Superior and Port McNicoll on Georgian Bay (Lake Huron) in Ontario, Canada. She carried passengers between these ports for the Canadian Pacific Railway's Great Lakes Steamship Service. Freight was also carried. The Keewatin was built and launched in 1907 so she's over 100 years old! In 1966 she was retired and became part of a historical preservation, docked first in Detroit then Douglas Michigan from 1967 until recently. Now she's back in Port McNicoll which was once known as the Chicago of the North due to the trains and ships coming into its harbour. In 1965 the trains and ships left and Port McNicoll's heyday was over. The ship will be restored and will become a permanent display as a maritime museum and event facility in Port McNicoll. Keewatin was among the last of the turn-of-the-century style overnight passenger ships of the Great Lakes. Hubs and I live nearby so yesterday we took a short car ride to see her. She's very impressive with her wooden passenger cabins and structure. The ship was a floating set for several maritime-related documentaries and television docudramas, including the torpedoed ocean liner Lusitania, the burned-out Bahamas cruise ship SS Yarmouth Castle, Canadian Pacific's Empress of Ireland as well as the Titanic. And so a little piece of history comes back home. Forgotten Cemetery Found, and I've Been Vindicated! Hubs didn't believe me. He insisted there was no cemetery in the location I described to him, and that I must be thinking of the small cemetery further south on the highway. There was no confusion; I knew exactly where the cemetery was and I'd seen it many times when I first settled in this area in the early 1970s. So I took hubs there. But it was gone. No tombstones were visible from the road. Since the spot I insisted held the stones was near a house, we didn't want to walk up and start looking around. And besides hubs was convinced I was wrong. We argued over this cemetery for a couple of years, with me growing increasingly frustrated that hubs thought I didn't know the difference between a much larger cemetery further south on a busy highway and the tiny 6 stone one on the hill in the country. Last week I was vindicated! The little cemetery has been found and it even has a name - the William Wilson Pioneer Cemetery. Apparently there are only a handful of us who remember it when there were any tombstones standing, and the memories are consistent - that 40 or more years ago there were about 6 tombstones which gradually disappeared over the years. Only one tombstone remains and it has fallen and is in pieces on the ground. What happened to the others that I remember - did they fall and are they overgrown with brush? Or were they taken in some youthful pranks? The Cemetery is in an isolated spot on the road to the local drive-in and it's possible that youngsters dared each other to run up and grab a stone. The burial records seem to be missing and all that is known is that there were once about 23 burials, many of them members of the Wilson family but others soldiers who died on the march up the Penetanguishene Road from York (present day Toronto) to the Naval Establishment at Penetanguishene. I'm kicking myself that I never copied the names on the stones when I first saw them, or took pictures, but then I remind myself that those were in the days before digital cameras or iPhones. Also I was a very young newly married woman making a new home and not as obsessed with genealogical preservation as I am now. My 2nd great grandfather was Michael McGinnis. He is said to have been born 1805-1807 in Dublin, Ireland. He was m. to Catherine McGuire in Ireland. Children born in Ireland were: Patrick- abt.1826, Edward-abt. 1829, and two daughters- abt.1831 &1834. A daughter, Ellen was born in New York, Dec. 27, 1836. The family inferentially dates his immigration to America between Jan.1835-Dec. 1836, possibly on the Barque Tweed (although no other family members are shown). He lived in Johnson Co., Iowa from 1841 until his death Jan. 11, 1870. I recently found his date of naturalization, July 22, 1844, in Dist. Court, of Keokuk Co., Sigournery, IA. The card only shows his name and country of birth as Ireland. No other information. Do you think there would be a Declaration of Intent record somewhere? I've checked Keokuk Co. clerk and recorder, public library, historical society, and genealogical society, without success. Bob - For naturalization records you may want to visit the USA section of NaturalizationRecords.com Since your ancestor naturalized in 1844, you will want to look at "Naturalization Records Before 1906". There should be a Declaration of Intent for your ancestor and it will almost certainly have more details such as exact date of arrival, but may not have an exact location of birth. Be sure to use the interactive map on this page to check for naturalization records specific to Iowa - both online and offline. If your ancestor arrived via New York, be aware that many of the 1830 arrivals are missing. So finding him or his family may not be possible. Also, they may have sailed into a Canadian port as that would have been much cheaper. Unfortunately Ships Passenger Lists arriving in Canada before 1865 are difficult to find (if they exist at all) as there was no requirement that they be kept. If your ancestor did arrive alone on the Tweed (and you haven't told me what your source is for this conclusion), be aware that men often sailed ahead of their family in order to establish a new place of residence. But I had a quick look at some online Passenger Lists and I noted that there were several men named Michael McGinnis (with variant spellings) arriving in the right timeframe to be your ancestor. So I wouldn't be too quick to jump to the conclusion that the Michael McGinnis sailing on the Tweed is yours without some concrete proof. This morning at 10 AM MST Ancestry.com will be adding 15 more states to the 1940 US Census database. Staff are working hard at Ancestry.com to bring the 1940 US Census to the public, and are now very well ahead of schedule from our initial completion predictions. Enjoy searching the following states, and look for more states coming soon. When Grandkids Start Asking About Great-Grandfathers - Yay! Yes brainwashing telling grandkids about ancestors does pay off! As many of my readers know, I brainwash tell genealogy stories to my grandkids every time I see them. We play genealogy games. We go on cemetery hunts. We play the Genealogy Board Game I created. Yesterday it all paid off. My 7 year old grandson was sitting on the couch with me and he looked up at our walls of ancestor photos, then asked, "Grandma, do I have any great-grandpas up there?" I showed him the photo of my dad in his army uniform, and explained that was his great-grandpa McGinnis. Then he asked who all the people were in the rest of the pictures. So we went through them one by one. "This is my great grandmother, so she is your great-great-great grandma!" He was fascinated and asked questions such as "What is she to my Daddy?" and "How do you get to be a great-great-great grandpa?" and "How old do you have to be to be a grandpa?" These questions allowed for an explanation of different generations, which he seemed to understand. I can't wait for the next round of questions! 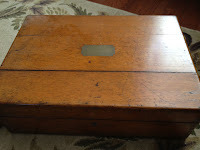 Since starting an antique box with my family odds 'n ends of genealogy treasures, I've run out of room. In fact I've filled three similar size boxes with my treasures. What do I keep in my treasure box? 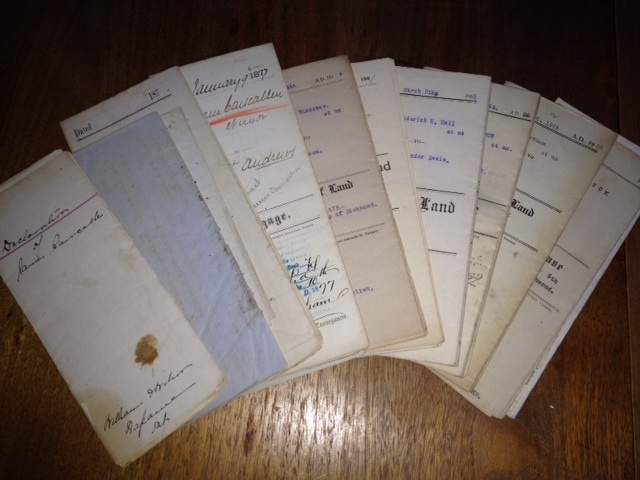 Original family documents (land records, deeds, marriage certificates, birth and baptismal records, death certificates etc), family bibles and journals, WW1 paybook and records for my grandmother's brother, school report cards, wedding invitations, letters, postcards and more. I only keep original items that belonged to someone in my family, not photocopies of records I've found while researching. 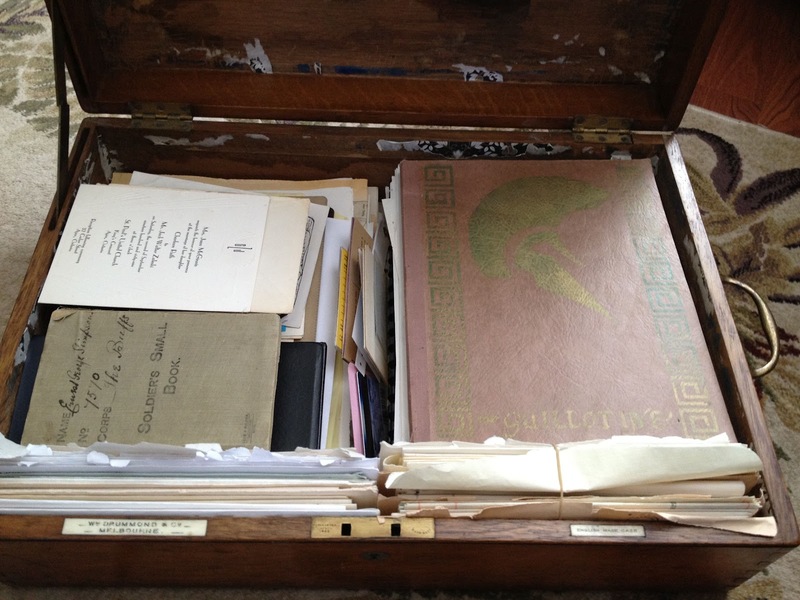 But because I was filling boxes so rapidly, I decided to transfer all my documents and records, family treasures and journals (my own plus my mother's) to one large antique blanket box. 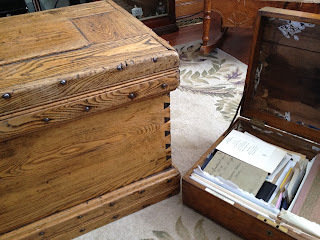 You can see the blanket box I'm going to use on the left in this photo. It already had a few items in it so I'm going to have some fun going through my smaller boxes and re-organizing the items to go in the blanket box. It's always fun to take that trip down memory lane each time I reorganize the treasures. I spent a few hours last time reading through my grandmother's handwritten recipes which I've kept. Hopefully you are keeping your own genealogy treasure box to be passed on to a descendant. This is the 1914-15 Star Medal for men who enlisted in the CEF in those years. To learn more about Pte Campbell I searched for his Attestation Papers in the CEF database online. John Campbell, born Sept. 21, 1885 in Glasgow Scotland, enlisted on 22 Sept. 1914, one day after his 29th birthday. His father's name was given as Hugh Campbell living in Glasgow. Pte Campbell gave his occupation as teamster and stated he had previously served one year in the Sutherland Highlanders. What happened to John? Did he survive the war? Family Tree DNA is having a summer sale. 76 million much-anticipated state census, naturalization, immigration, and vital records were added this week for 22 states, including Ohio, New Jersey, New York, and Pennsylvania. Since partnering with the National Archives of Italy to digitally preserve and index its civil registration, more than 24 million images have been published and 4 million names have been made searchable on FamilySearch.org. Millions more free records were published this week for Armenia, Brazil, Canada, Chile, China, Colombia, Czech Republic, Estonia, Germany, Hungary, India, Ireland, Japan, Netherlands, New Zealand, Peru, Poland, Portugal, Russia, Slovakia, Spain, and Switzerland. Search these diverse collections and 2.8 billion other records for free at FamilySearch.org. I subscribed to the site several months ago and am delighted with the items I'm finding on ancestors. They are busy adding new pages daily and state that they have 5,329,460 scanned pages as of today. In my first month of use, I encountered a problem. When I clicked on a "hit" for an ancestor, I could not find his name in the newspaper page that loaded. I read the entire page several times and even clicked back and forth a few pages but to no avail. So I wrote to explain that I'd been hunting for over an hour and could not find the entry. To my surprise, their customer service responded very quickly and were extremely helpful. Even after I was given the correct page and URL to view it, I couldn't spot the name. I finally decided I was too frustrated to continue hunting and wrote back to request more guidance. The very patient customer service rep provided me with an exact column number and start of the paragraph containing my ancestor's name. With that help I was able to spot the bit I needed. Since then I've had no problems with an incorrect link and I've looked at many. With both my maternal grandparents being born in England I've got a lot of English ancestors to look for! I like their search engine. You can narrow your search with filters for date, region, county, specific place, type of article, public tags, or specific newspapers. Once you find an entry you want to view, you simply load the page. Sometimes your search term is highlighted but not always. Usually the block of text where your search word is located is a darker grey, but again this does not always happen. The majority of the time it does and that makes finding the entry much easier. You can order a copy of the newspaper page for a fee or you can download it to your computer. Downloading it does not give you a very clear image so what I do is enlarge the bit I want then do a screen dump. It gives a better image than downloading. If there was something really special I wanted to save I'd pay for a better copy. The one caveat you should be aware of is that when you purchase an unlimited membership, it's not really unlimited. As the website points out in their Terms, unlimited membership is subject to their Fair Usage Policy. This policy spells out that you are permitted to view an average of 1000 pages per month (calculated over a 3 month period). If you get close to the limit, the company will send you an email to warn you. Personally I don't like paying for something that is called Unlimited when it isn't unlimited. No matter how nicely the site explains it, I felt tricked that they didn't just call it the "1000 pages per month membership" or "Sort of kind of unlimited membership" or something totally upfront and transparent. Yes I did purchase an Unlimited Membership but the smaller credit options wouldn't have been enough for me given the sheer number of English ancestors I want to hunt for. And I don't like subscription websites where I have to buy x number of credits and woe is me if they expire before I use them all. Because I'm very apt to forget or get busy and lose credits. So the bottom line is that I'm very happy with the site and with my "unlimited" membership (even though it isn't unlimited) and I've never been warned that I'm at my 1000 monthly views limit. But I still wish they'd come up with a more honest name for it. Or remove the limit. Well it's that time again. In a month I have my annual Family Fun Day coming up. We always have a team event with prizes and lots of activities to choose from and this year I was having trouble coming up with something new. I've created Scavenger Hunts, Genealogy Races, Amazing Race Genealogy style and more. But I wanted something new and something a little less work. Finally I've got a plan thanks to a little story my youngest son told me of a Military challenge he participated in! All I have to do was tweak it for my family and add a genealogy twist. The basic idea is that I'll place 10 to 12 objects on a table in our shed and cover them with a sheet. The objects will have some kind of genealogy aspect to them - perhaps a photo of Great Grandma Simpson, the toast rack she owned, a family bible, etc. I might throw in non-genealogy objects such as a kitchen colander or a shovel - ordinary items you'd find in or around your home. Family members will be partnered by finding their match to an Ancestor card I'll give each person when they arrive. The object is to race to the shed, study and memorize the objects then participate in 3 games of skill before heading to the last event. At the last event teams will write down what objects they saw in the shed. If they're wrong they go back to the shed and start over. 1. Toss a frisbee through a hanging hula hoop. Not as easy as it sounds. 3. Run to the pig pen and taking one scoop from a pail of food, toss it over the fence to entice the pigs out of their barn. Team members must call out "Piggy piggy oink oink oink" as they toss the food (hubs will be there to monitor the calling). The task is to count all our pigs. I am laughing already thinking of my family completing task #3. Did your family fight for your freedom or work to establish our great nation? The second of two promotions from Flip-Pal Mobile Scanner for the upcoming American Independence Day and Canada Day celebrations starts today. Readers know how much I love my Flip-Pal and I'm always happy to share the news of any sales or coupons to help you purchase your own. The following promotion codes are valid 12:00 a.m.–11:59 p.m. Mountain Time (-6 GMT) Please note: these promotional codes cannot be used in conjunction with other promotion codes.